Food trucks on Union: It’s Saturday morning! | Oh, the Places We See . 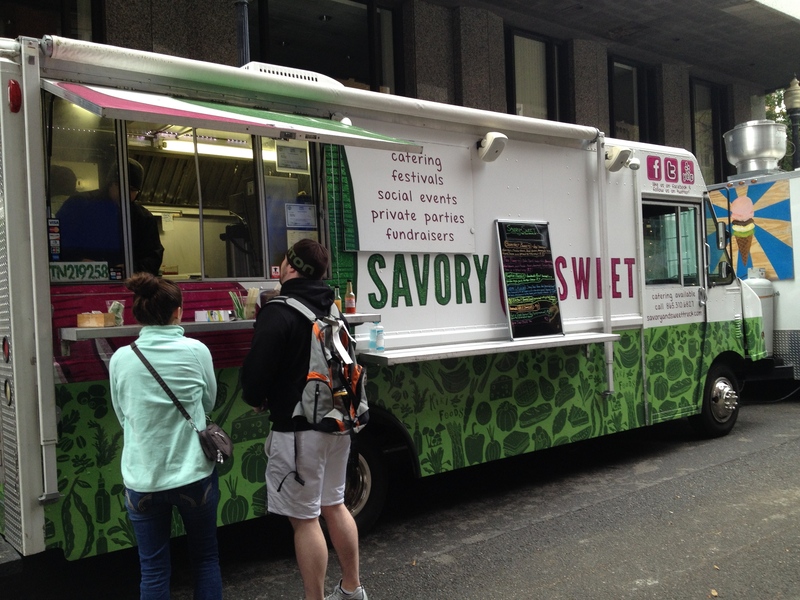 . .
Food trucks on Union: It’s Saturday morning! 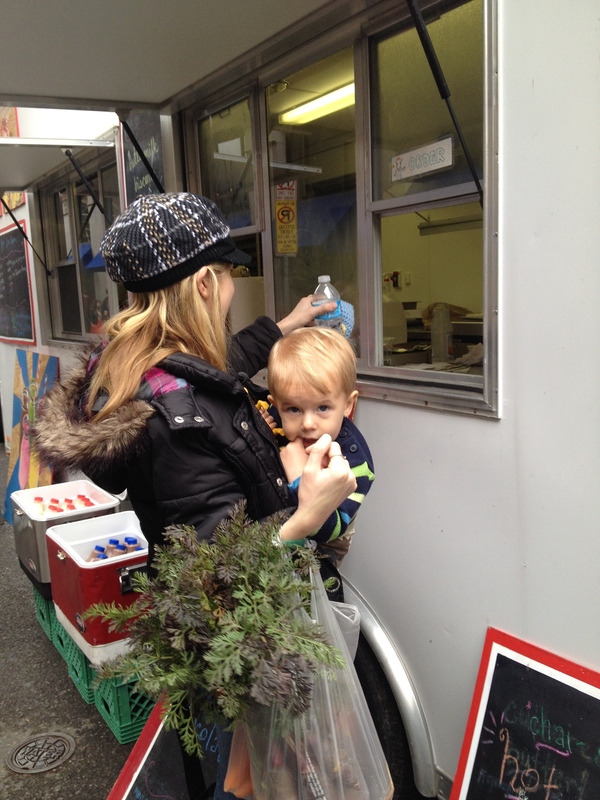 Just about everyone loves the new food trucks on Union Avenue on Saturday mornings! Saturday mornings in downtown Knoxville are just downright fun! You might not think a farmers’ market could bring out the masses, but it does, and for good reason. Even with the bulk of Tennessee crops gone for the season, the Saturday Farmers’ Market still thrives. We saw vendors with crafts and such, farmers with greens and cool weather veggies, and workmen setting up the holiday ice rink. And with today’s warmer weather, people were out walking their dogs, strolling their kids, sipping coffee, and buying something local to eat from ood trucks on Union Avenue! Parked closest to Gay Street was Mister Canteen. 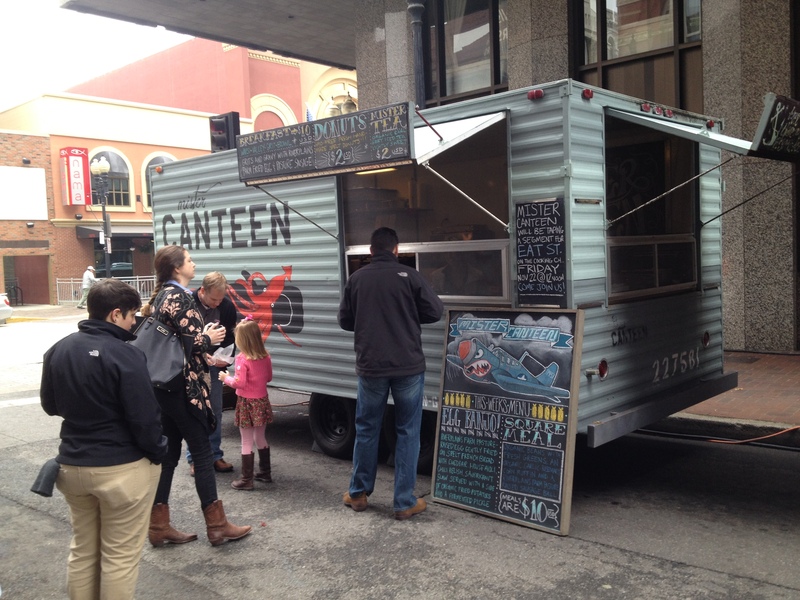 It’s a simple, boxy truck advertising the food of the day on cool chalk boards. Like Wapsi Valley Grit Bowl: grits and gravy with Riverplains Farm fried egg and pasture sausage for just $10! And to wash it all down — Mister Tea: organic Earl Grey iced tea lightly sweet for just $2! A sign to the right of the window said that Mister Canteen will be taping a segment for Eat St. on Friday, November 22nd at noon. You may want to head downtown for your 10 minutes of fame — or just to say you’ve been there! Hoof wasn’t quite as busy at the breakfast hour when we were there, but I have no doubt that lunch will pick up since Hoof advertises grass-fed burgers and farm fresh creations. I’d be tempted to try the English muffin with sweet fennel sausage, cheddar, and an egg for only $6, but I might hold out for lunch so I could eat big on the Smokehouse Burger: bacon, cheddar, with smoked onion jam for $12! 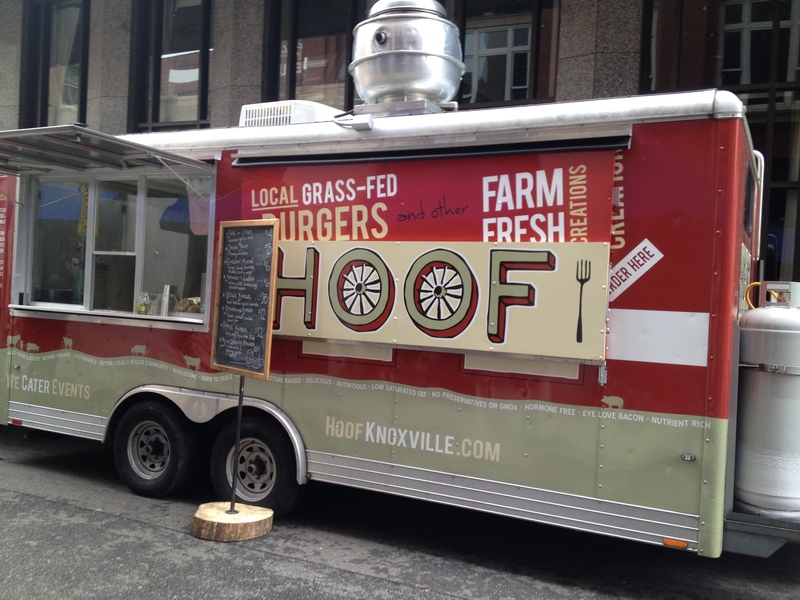 Hoof offers grass-fed beef in their burgers. Tootsie Truck posted a sign that read Temporarily Closed due to technical difficulties, so breakfast was out of the question. But if you got there for lunch, and they were open, you could try a Local Pheasant Plate for $11, a Pork Belly Plate (with sides of organic blackeyed peas and local turnip greens) for $9, or a Jerk Chicken Plate for $8. All sounds good. Savory & Sweet has been around a while, and I’m a fan of their Pork Burrito (coffee chipotle smoked pork, Spanish rice, black beans, jack and cheddar cheeses, homemade salsa, and chipotle crema in a spinach wrap) all for $8! But they also offer Pumpkin Ravioli ($7) and Cuban Lasagna with local grass-fed beef from Strong Stock Farm ($7). 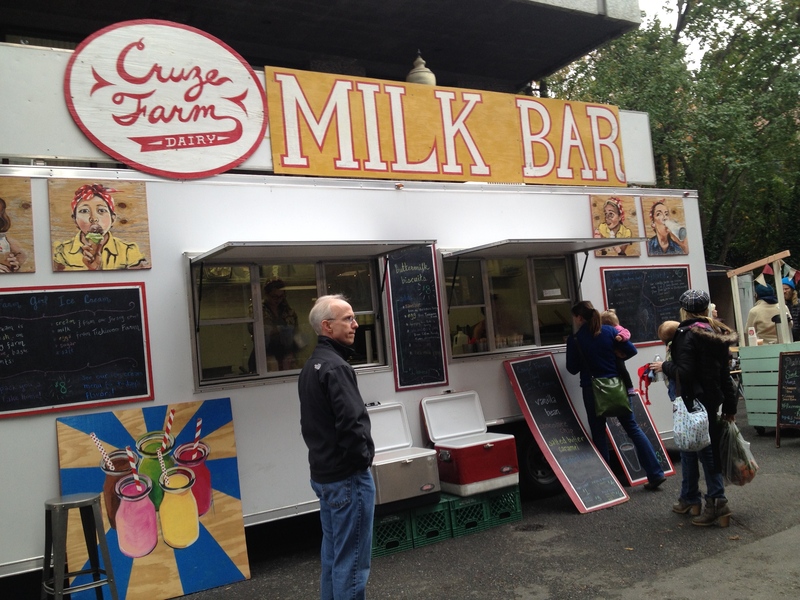 The Cruze Farm Milk Bar was there sporting new artwork. (Well, new to us.) 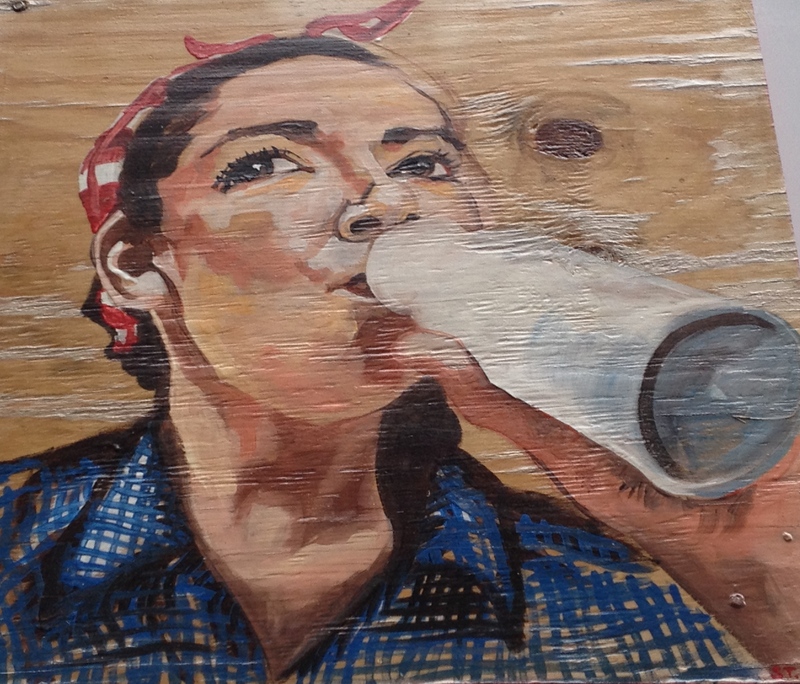 Those cute Cruze Farm Girls were painted on plywood — one licking a cone and the other sipping fresh milk from a bottle! Also new was what they call the Dolly Parton duets — double scoops in a cone! Like salted butter caramel paired with vanilla bean or chocolate chip paired with that same great-sounding salted butter caramel. Mmmmm. Double trouble! The Dale’s Fried Pies stand reminds me of a child’s lemonade stand but they offer delicious sweet or savory pies instead of lemonade! Today’s sweet pie choices were apple, cranberry brie, and candied sweet potato. In the savory category were sausage, egg, & cheese; chipotle mac & cheese; and turkey pot pie. If you wanted to warm up, rosemary apple cider would only set you back two bucks! 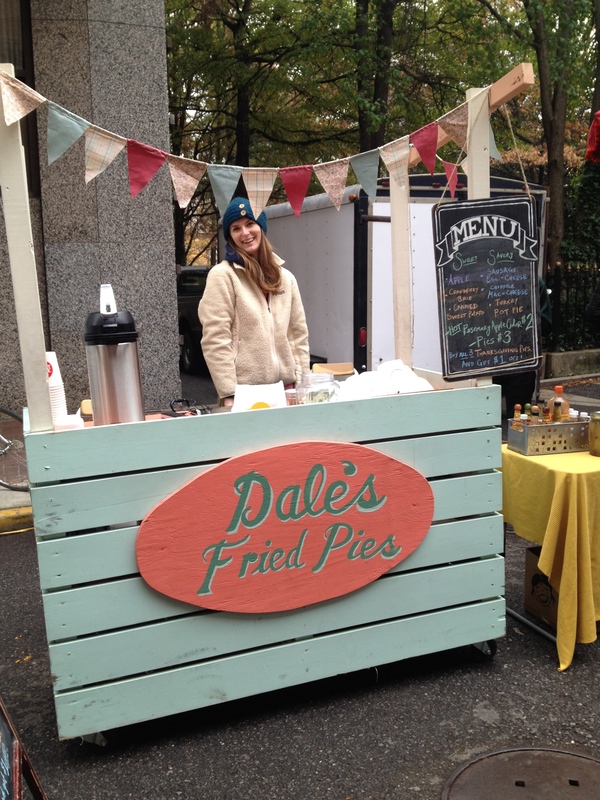 Dale’s Fried Pies: Savory or Sweet? 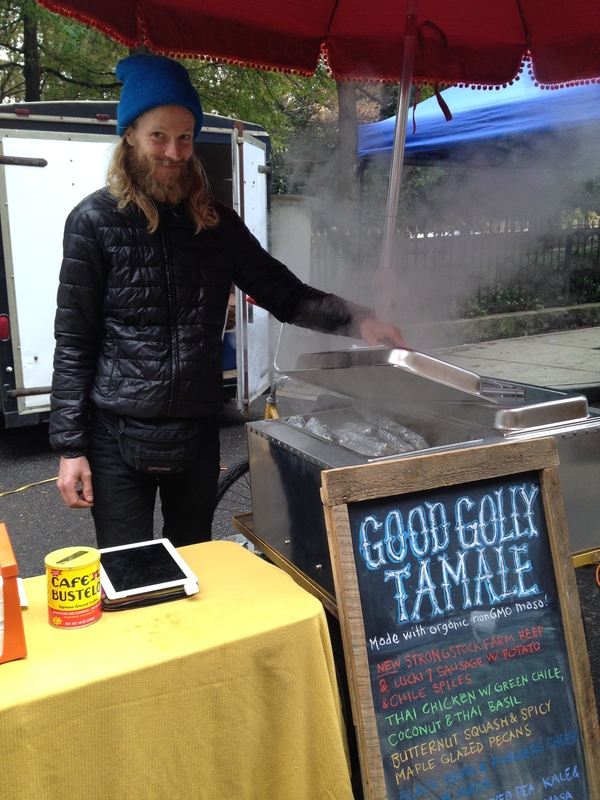 Last on the row was Good Golly Tamale, a stand under an umbrella where hot foil-wrapped tamales were awaiting your decision. Would it be the new Strong Stock Farm beef? Or Thai chicken with green chile, coconut and Thai basil? Or butternut squash with spicy maple glazed pecans? Or maybe black bean and farmer’s cheese on blue masa? Good golly. Get one of each! The food scene in downtown Knoxville has just gotten even more complicated. And there are more reasons than one for coming downtown on Saturday. So, shop the booths, sip the coffee, and try something new while standing on Union Avenue. There are worse things than being a food truck foodie! This is post #16 for National Blog Posting Month (NaBloPoMo) for 2013. 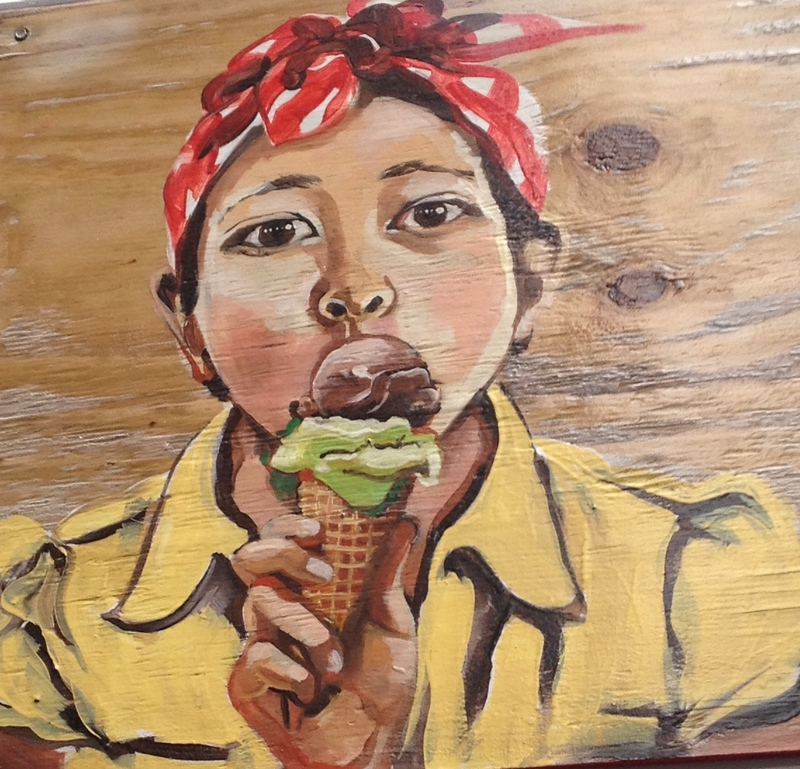 This entry was posted in Farmers Market, Food, Tennessee, Travel and tagged Cruze Farm, Dale's Fried Pies, food truck, Good Golly Tamale, grass-fed beef, Hoof, Knoxville, Mister Canteen, Sweet and Savory Food Truck, Tootsie Truck, Union Avenue. Bookmark the permalink. 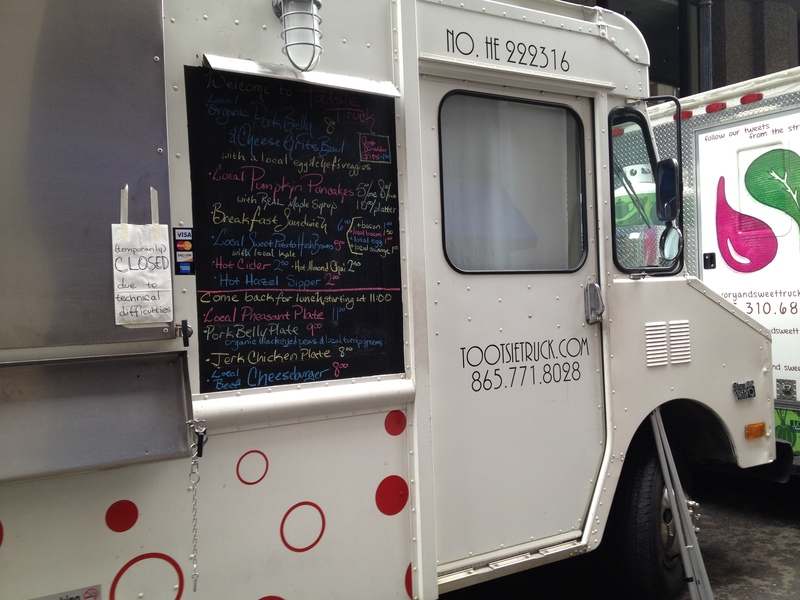 11 Responses to Food trucks on Union: It’s Saturday morning! I’ve never heard of Roach Coaches!!! LOL!!! Thanks for sharing that info. But I may never look at these in the same way again!! You are so right! We ate a lot of carbs — couldn’t resist the pastries on Saturday!!! A great post, lovely photos! Love the gals on the boards and LOL on the Dolly Parton! This entire place would set me back weeks on my healthy eating routine!!! The pictures caught my attention, for sure. Sometimes the girls are there in person. It may have been too early when I was passing by. All these look so delicious. We have a food truck scene in Toronto, but I’ve never been to a “gathering” of sorts…I’ll have to get on that! Gosh. Wonder how I could wrangle a trip to Toronto to see your food trucks!!! (And everything else I’ve always wanted to see up your way!) Thanks for reading and commenting!